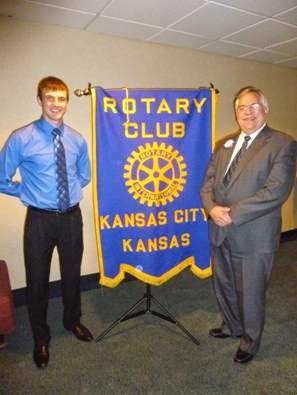 KANSAS CITY, KAN. ----- The Kansas City, Kansas Rotary Club, at its May 6th luncheon, announced the winners of its annual Student Scholarship Contest from the Wyandotte County high schools. The Club awarded $1,000 college scholarships to each of the winning students: Betty Gillespie from Turner High School and Noah Jaksetic from Bishop Ward High School. The Club awards two scholarships each year, one to the top female and one to the top male. These students competed with other outstanding high school students from the nine Wyandotte county schools. All the students exemplify the highest academic, service and character standards in our community. We can all be proud of what Wyandotte county has helped produce in these students. The Rotary Club congratulates them, and wishes them the best in their pursuit of higher education.